Rugby Town travel to Sutton Coldfield for their second run-out of the pre-season campaign this Saturday, following a 3-0 win at MFL Division One side Heather St.John’s last weekend. Second half goals from Harry Holloway, Lewis Rankin and trialist Bora Manel Barry ensured it was a successful opening outing for manager Carl Adams’ new-look Valley squad. Adams was missing a number of his key summer arrivals - including defenders Loyiso Recci and Lee Thomas and keeper Matt Hill, but there were still a number of familiar faces on show for the early kick-off, with the previously announced committed group of Rankin, Richard Blythe, Justin Marsden, Luke Edwards and Charlie Faulkner all returning to play for the club again. Full-back Keenah Rosser - who made four appearances for Town in 2015 - was also in Saturday’s line-up. Young striker Sam Lockley joined Holloway as the second member of last season’s squad to feature, whilst amongst the new faces were the trio of Dominic Perkins, Daniel Cavanagh and Danico Johnson. Perkins is a centre-half who has had spells at Boldmere, Redditch, Bedworth and Romulus, whilst full-back Cavanagh has been at Bedworth for the last two seasons. Striker Johnson was at Southern League Premier Division Redditch last season and also lists Romulus, Coleshill and Hednesford among his former clubs. This weekend’s hosts Sutton Coldfield will play in the Southern League Division One East in the coming season, following their last place finish and relegation from the NPL Premier Division in 2017/18. # The draws for the opening rounds of Rugby’s two main knock-out competitions were made last week, and Town face an FA Cup Extra Preliminary Round tie at Coventry United for the second year running. 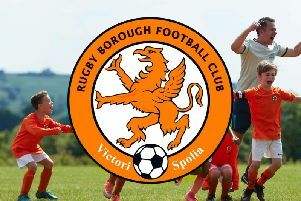 The match will be played on Saturday, August 11 and the winners will earn themselves a home game against Southern League Evesham in the Preliminary Round two weeks later. Valley’s FA Vase campaign begins in the Second Qualifying Round this time round, and they will open this with a trip to either Melton Town or Ingles on September 15. Melton sit one level below Rugby in the UCL and Ingles will play in the East Midlands Counties League this season following their promotion from the Leicestershire Senior League.